Follow our handy tips and watch our step-by-step guide to make sure you get the best possible results from your Amigurumi animals kit. 1. A slip ring, which goes by many other names, such as ‘magic ring’, is a great technique for making toys. This is because the loop can be pulled tightly to close completely so that none of the stuffing will fall out. You wrap the yarn around your left index finger, insert the hook into the ring, take yarn around hook and pull through, then work a chain stitch. Once you’ve worked the number of double crochet stitches stated into the loop you can pull the tail end to tighten. 2. Begin to stuff your ball body four rows before the finish. This method is much easier than forcing the stuffing through the tiny gap at the end, which can distort the crochet fabric. Push the stuffing as far down as possible to prevent catching it in your stitches – but don’t worry too much if this does happen because you can poke the stray bits of filling through using your hook once you’ve finished. You can also add some more toy filling at the end for extra firmness if the ball body needs it – do this before you run the yarn through the final round and pull to tighten. 3. 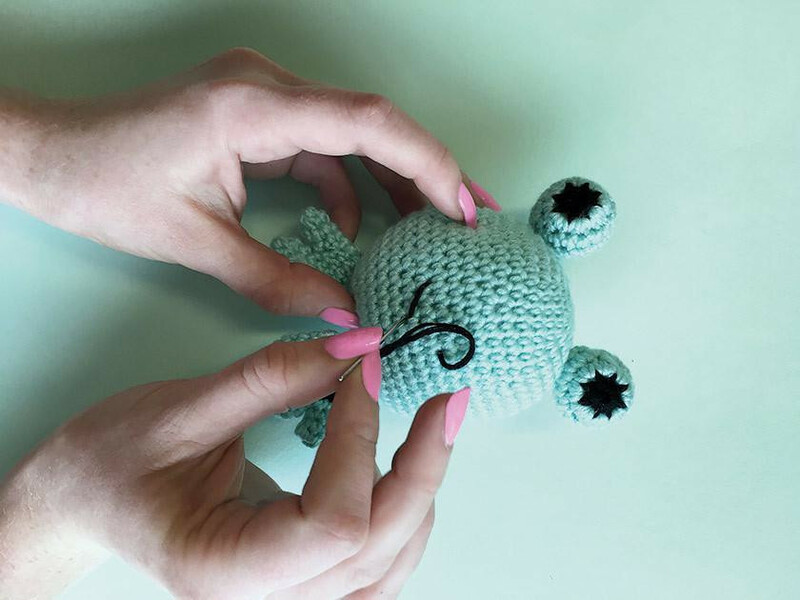 Some of the smaller stuffed pieces, such as the frogs eyes, require you to run a strand through the last round and pull to close in order to create a ball shape. However, some of the crocheted pieces are stitched in place without completely closing them off –the pig’s trotters, for example. Make sure you refer to the instructions on how to finish each piece before you attach 4them to the body. 4. In order to create the fold in the bunny’s ears, fasten off leaving a long end (about 30cm), flatten the last round and using a blunt tipped needle, catch the stitches on either side together all the way along the edge. Fold this edge in half and seal ends with one stitch. The same strand can be used to attach the ears to the top of the ball, using the pictures as a guide. 5. The frog's toes are worked as three separate pieces before they are worked together to form one complete foot. Do not fasten off after you’ve worked the third toe - instead, place all three toes in a row and work double crochet into the stitches along the fastening-off edge of the toes to join them together. The rest of the foot is worked in one piece using double crochet. 6. All the animals' embroidered features are worked in your black yarn. Refer to the pictures as a guide for where to place the embroidery. The frog’s, rabbit’s and pig’s mouth is made with two large diagonal stitches placed in a V shape. The dog’s nose is embroidered with straight stitches (about three) just above the tongue. Don’t fasten the stitches off until you are happy with the placement, just in case you need to adjust it.